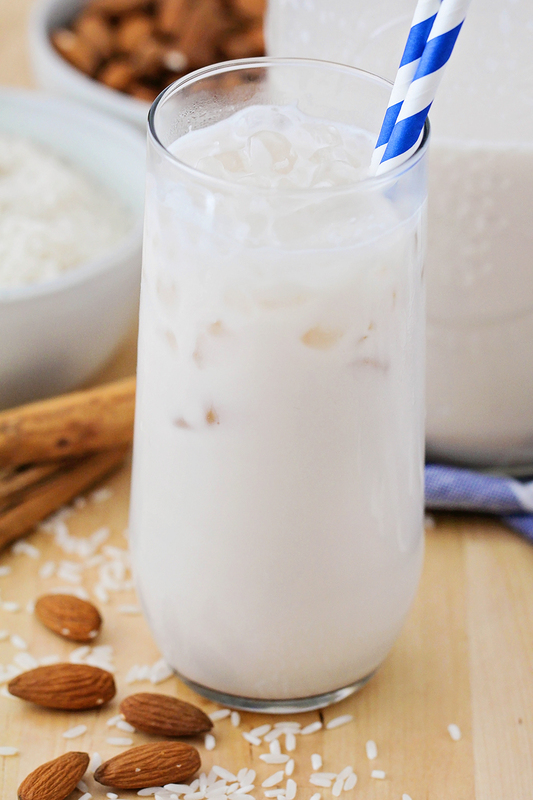 This delicious and refreshing homemade horchata is so easy to make, and tastes amazing! 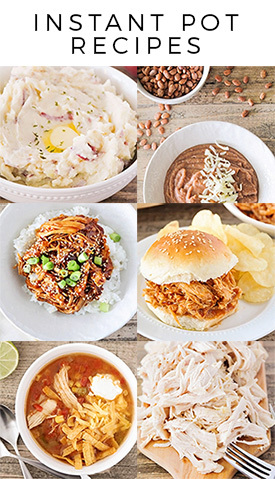 Who else is totally obsessed with horchata? I totally cannot get enough of it! 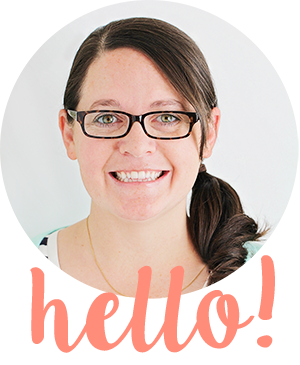 Several years ago I worked across the street from a tasty Mexican fast food restaurant, and I would walk over nearly every day on my lunch break and get a giant cup of cold horchata and a bowl of chicken tortilla soup with a stack of freshly made tortillas. It was the perfect lunch, and the perfect way to pull myself back together when I was all stressed out from work. Since we moved to Portland, I haven't been able to find a good place close by that has good horchata. (I'm sure one exists, but I just haven't found it yet.) I've seen recipes for homemade horchata on Pinterest, and decided to try it out. 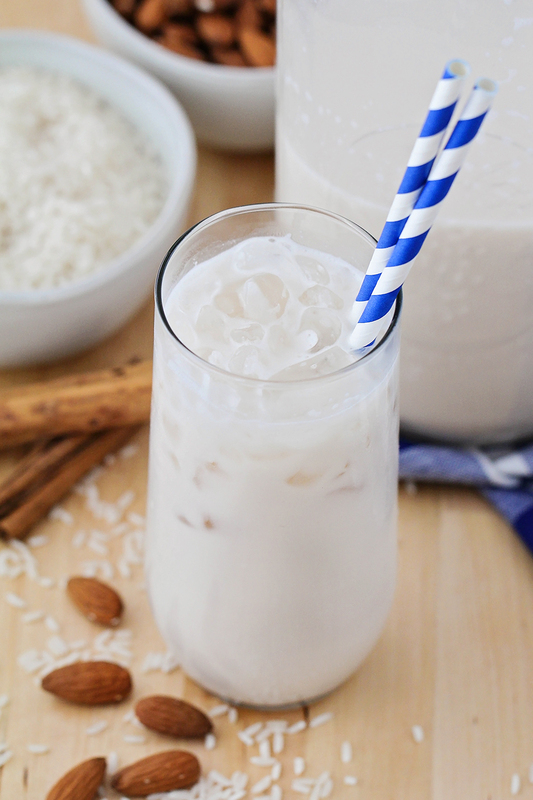 The result was this incredibly delicious, creamy and sweet, easy to make horchata! It has a fantastic flavor, and it's incredibly refreshing. I think it's best served over lots of ice and slurped up with a straw. It is pretty much my new favorite drink! The horchata does take a little time to make, since you need to let it sit overnight, but the hands-on time is minimal, so it's just a little effort for a big payoff. I would definitely recommend straining it through a nut milk bag (they're pretty easy to find on Amazon or at health food stores) because there will be a lot of sediment that needs to be strained out. As far as the sugar goes, I like my horchata pretty sweet, but if you prefer it less sweet, you could definitely add less. This is definitely one to try! Heat a small pot of water to boiling over high heat. Add the almonds to the boiling water and boil for one minute, then drain and rinse with cold water. Squeeze the almonds to remove the skins. Discard the skins and add the blanched almonds to a quart size jar. Add the white rice and the cinnamon stick to a coffee grinder or food processor and blend until finely ground. Pour the rice mixture into the jar, then add three cups of water. Shake gently to mix, then let sit overnight. The next day, pour the mixture into a blender or food processor and blend until smooth. Strain through cheesecloth or a nut milk bag, squeezing to get all of the liquid out. Stir in the remaining water and the sugar until dissolved. Refrigerate until chilled, and serve over ice. Shake before serving.